Paper circuits are a way to add light to drawings or other paper creations. These circuits are created by attaching a battery to LED lights with a variety of conductive materials, such as conductive tape or paint. More advanced projects can involve switches, parallel circuits, pressure sensors, and more. Creating paper circuits can teach not only the basics of electronic circuitry, but also about design, iteration, troubleshooting, collaboration,creative expression, and more. More tutorials and examples are below. Create a paper circuit that represents 2 monomials — one has the same exponent as the other's coefficient. 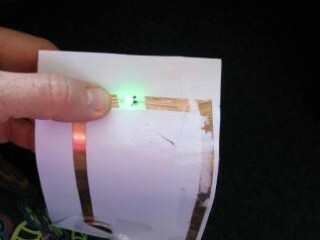 Paper Circuits – Making Energy Transfer Visible! In this lesson students will connect their knowledge of energy transfer and types of energy to the awesome experience of making their own paper circuits. Every student will have their own example of a circuit and a great physical representation of energy transfer. You will even see opportunities to create a scene with your paper circuit or make other fun cross curricular connections! This lesson would be the 2nd or 3rd lesson within a mapping unit: http://empolski.wordpress.com/maker-movement/ In this activity, I want my first grade students to be able to successfully orient symbols around their house using a key to represent 3-5 objects on their map. One of these symbols will be an LED light representing their house. Therefore they can illuminate the position of their house, using paper circuits. Students will use paper circuits to connect texts from a World War II unit in both language arts and social studies. Students will also make symbolic connections between the texts through their project and write about their choices in an explanatory piece. This is a lesson plan aimed at 4th graders. Perfect for learning how-to process. Your students can choose a tech tool to learn about and then make a how-to presentation teaching others how to make their creation. Beginner tutorials from Chibitronics to help you get started with paper circuits! Each tutorial comes with free a downloadable template for classroom use. A guide to paper circuits, info on origami paper circuits, light-up cards, and more! This work by (various) is licensed under a Creative Commons Attribution 4.0 International License.